A new BioShock Infinite trailer is set to debut on October 21st, and fans get to play a small role in directing it. 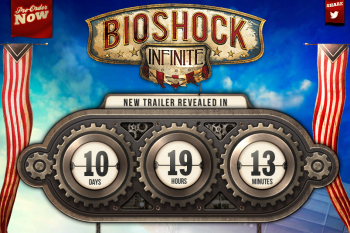 Publisher Take-Two is putting the power in your hands for the upcoming release of a fresh BioShock Infinite trailer. The game's official Facebook page has just been updated with a countdown clock and a voting feature that gives fans a chance to pick what they would most like to see. Once you click the "Like" button, a series of either/or questions pops up letting users choose various characters and locales that have been teased in the past. You'll need to pick either zeppelins or skylines, the Handyman or the Motorized Patriot, and the lovely Elizabeth or the frightening Songbird. There doesn't appear to be any way to check in on the current voting trends, so it's impossible to know how your picks are holding up with public opinion. The countdown timer - in all its retro-mechanical glory - will end in the early morning hours of October 21st, at which point we expect the crowdsourced trailer to go live. After being pushed from its 2012 release window, BioShock Infinite is now scheduled to hit stores on February 26, 2013. After the delay, the developers decided to pull the game from assumed appearances at both E3 2012 and Gamescom. As we creep closer to the new launch date, it appears Irrational Games is ready to once again drum up excitement for the new title.